Joyce Mushaben- "Becoming t he World's Most Powerful Woman"
Joyce Marie Mushaben is a Curators’ Professor of Comparative Politics and former Director of the Institute for Women's & Gender Studies (2002-2005) at the University of Missouri-St. Louis. Fluent in German, her teaching centers on comparative public policy, the European Union, women's leadership, citizenship, immigration, mega-cities and sustainability issues. Her research covers new social movements, youth protest, German unification and identities, gender, ethnicity and welfare issues, EU migration and integration studies. Her books/monographs include Identity without a Hinterland? Continuity and Change in National Consciousness in the German Democratic Republic, 1949-1989 (1993); From Post-War to Post-Wall Generations: Changing Attitudes towards the National Question and NATO in the Federal Republic of Germany (1998); The Changing Faces of Citizenship: Integration and Mobilization among Ethnic Minorities in Germany (2008); and, Gendering the European Union: New Responses to Old Democratic Deficits (co-edited with Gabriele Abels, 2012). 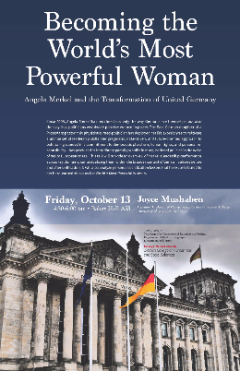 Her latest book focuses on Becoming Madam Chancellor: Angela Merkel and the Berlin Republic (forthcoming 2016). Her articles have appeared in World Politics, Polity, West European Politics, German Politics, German Politics & Society, the Journal of Peace Research, Democratization, Politics & Religion, Citizenship Studies, Journal of Ethnic & Migration Studies, German Law Review and Femina Politica. A past president of the German Studies Association (USA), she has also served on the Executive Boards of the International Association for the Study of German Politics and the German Studies Association, as well as on selection committees for Fulbright, the German Academic Exchange Service and the American Council of Learned Societies. She is a current Editorial Board member for German Politics & Society, German Politics and Femina Politica. Having received a 1999 Trailblazer Award and the Chancellor's Award for Excellence in Research Creativity in 2007, Mushaben is a three-time Alexander von Humboldt Fellow, a former Ford Foundation Fellow, German Marshall Fund grantee and DAAD recipient. She has held guest-scholar posts at the Academy for Social Sciences (GDR), the Center for Youth Research (GDR), the Chinese Academy of Social Sciences and the Center for Transdisciplinary Gender Research (Berlin). She was named the first Research Associate in the BMW Center for German & European Studies at Georgetown University, has enjoyed Visiting Professorships at the Ohio State University, Berlin’s Humboldt University, the Missouri-London Program and at the Universities of Erfurt, Stuttgart and Tübingen (Germany) , inter alia. Affiliated with the American Institute for Contemporary German Politics (Washington D.C.) and a designated Fulbright Specialist, she is commonly known as "Dr. J."